Today is Chinese New Year, and it is the year of the rabbit! So I thought it would be fun to do a round up of bunny plush. Sweater turned rabbit, tutorial on Craftzine. Men’s suit turned rabbit, instruction from Martha Stewart Living. This crochet white rabbit is too adorable — must make! Pattern for Alice’s white rabbit from Crafty is Cool. 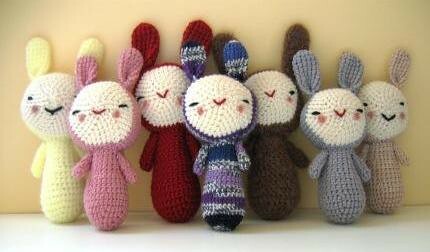 And rabbits for the knitters too! 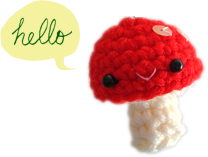 I think it would make a great baby shower gift, with a jingle bell tossed into the stuffing. Pattern for Bunny Nuggets by Rebecca Danger. This is not a plush, but I thought a change of scenery for the new year would be refreshing. Download reedbunny wallpaper on Jinjerup! Wishing you a healthy and blessed year of the rabbit!